How we communicate change is the prevailing issue. Get it wrong, and the water cooler talk of bungled speeches, misinformed executives, and downright dumb comments can be lethal to the business results. The change may not be that significant, but if the communication about the ‘change’ is not well rehearsed, it does more to undermine future results than the ‘change’ itself. Notice I said, “rehearsed” because many senior leaders I know, forego the practice and think the ‘words speak for themselves.’ The resulting disengagement of employees away from leaders who don’t properly rehearse change communications can cripple a business. Negative talk, after a poor communication will dominate everyone’s time, versus conversations that could grow the business. 1. Plan the “how” of the communication as much as the content itself. Should you give a speech, send a memo, gain more input, follow-up with a survey, or address everyone at once? These decisions are more important than the words themselves, and the right answer is dependent on numerous variables. UCLA research concluded that words are only 7% of the message; 93% of the message is the verbal tone and body language associated with proper influence of any communication – and none may be more important than “how” change is communicated. 2. Share with clarity what you know will happen. Don’t sell what you want to happen. Sell honesty. Including specifics of what old paradigms will be gone. 5. Share with clarity those things you know will not happen. Frame the new baseline – including the specific assurances of those resources that will not be lost, and portions of activities valuable to the culture and purpose that are not changing. People have to and get to implement the changes and their emotional energy means more to success than the mental energy used to create the change. John Kotter and Dan Cohen, authors of The Heart of Change, are successful change leaders finding solutions to the problem of change communications. They showcase people using engaging and compelling situations to change. They recommend a people-driven approach that helps people to see the reason for change. They argue that people change when they are shown the truth because this influences their feelings – the emotions at the heart of change. See – Compelling and eye-catching situations are created to help show people what the problems are and how to resolve them. Feel – Visualizing ideas evokes a powerful emotional response that motivates people into action. 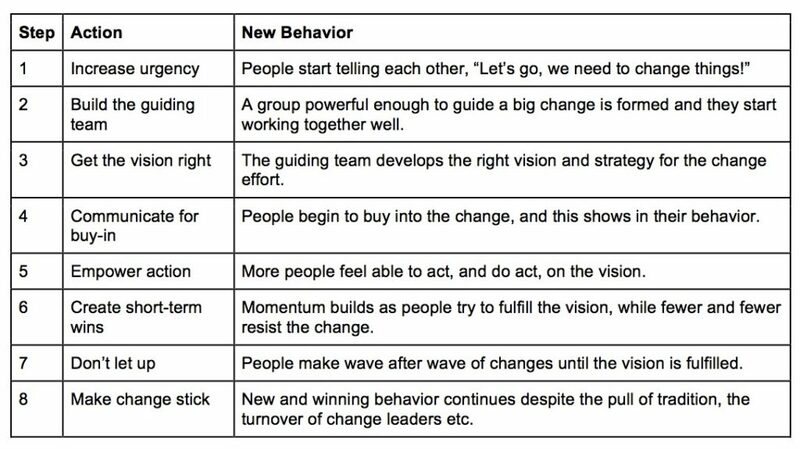 Change – The new feelings change or reinforce the behavior that make people work harder to make a good vision a reality. The change is more immediate but must be reinforced to keep up the momentum. How many psychiatrists does it take to change a bulb? 1 but the bulb has to want the change. Help people find their own wants through change, and amazing things happen.